On Monday 20th of May, the 11th Anniversary of Timor Leste’s Independence Day, we attended the Liturgy Service and activities the schoolchildren of Maria Regina Primary School at Avalon undertake to celebrate and support their fellow schoolchildren in Soibada. A day filled with classroom and playground activities, such as learning ‘Catching prawns’ and other traditional dances this year with Leila Dos Santos, singing songs in Tetun and creating artworks based on these form part of Timor Leste Independence Day celebrations at the school. Children may also purchase small handcrafts made in Pittwater or by Soibada people, fund raising activities that allow them to participate in investing in the various projects of friendship with their sister school in Timor Leste. 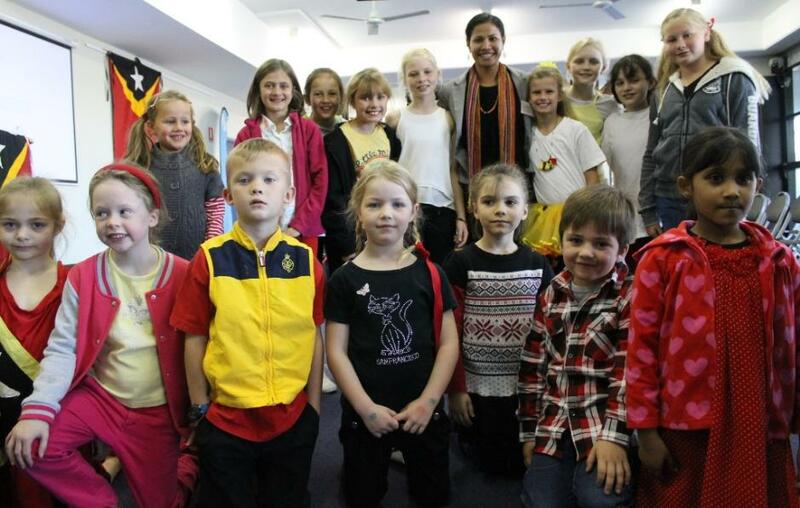 The children dressed in the colours of Timor Leste, some with special t-shirts they'd created just for this day. Attending this year were children from Sacred Heart School at Mona Vale and their Social Justice Committee representatives. These children are hoping to establish a similar link with a sister school in Timor Leste we asked one of these children if he liked what he thought of what he’d seen and heard so far after the Liturgy Service the school captains and other children speak at this year and he said he really like it, that it ‘made me think’. Also attending were the Consul-General of Timor Leste, Her Excellency Maria Jose DeJesus and Brother Darius – Assistant Priest of the Catholic Parish. Her Excellency read the School Prayer in Tetun this year, a language many at the school are becoming very good at. 20th of May 2013 is a very important day in the history of our friends in Timor Leste. Eleven years ago Timor Leste won their right to become an Independent Nation. Today we celebrate Freedom and Friendship. We especially celebrate Maria Regina’s and the Pittwater community’s growing friendship with Timor Leste and the people of Soibada. The people who have come to join us today in our Liturgy is a testament to that growing friendship. Timor Leste, or as it used to be called East Timor, is one of Australia’s closet neighbours and is located north of our nation. For over four hundred and fifty years East Timor has been ruled by foreign powers such as Portugal and Indonesia. After a long struggle the east Timorese people were allowed to vote for Independence. This meant they were finally given the opportunity to say whether they wanted to elect their own government or remain being ruled by Indonesia. So on the 20th of May 2002 the people of East Timor were finally allowed their freedom and independence. Today they continue to rebuild their young nation promoting respect, peace and harmony. 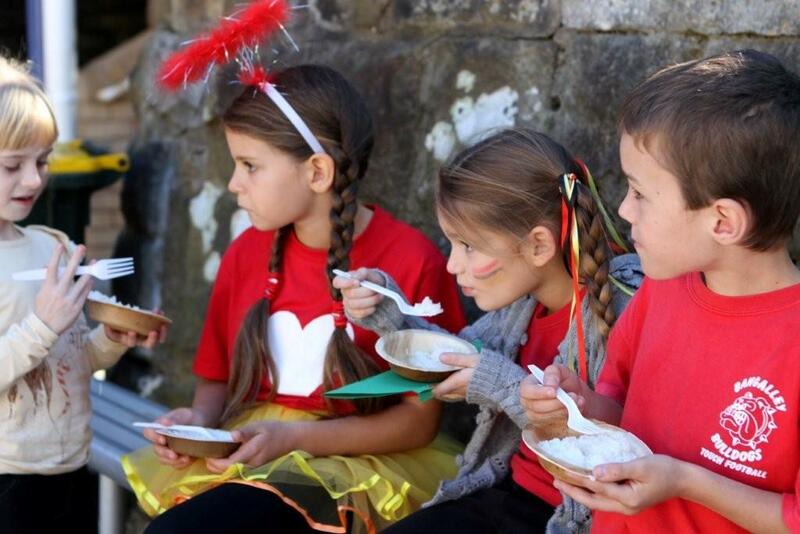 The Pittwater Community’s commitment to assisting Timor Lest began right here at Maria Regina Primary School. With the support of Pittwater Parish, other local churches and that of Pitwtaer Council it has grown to encompass the community. It is our goal here at Maria Regina to ensure the children in Soibada get the most out of their education. The money that we raise from days like today help to buy school supplies and food for the local orphanage. The children then watched a short video made by David Haythornthwaite as a prelude to the children presenting this year’s Liturgy asking them about differences they noticed between the life of the children in Soibada and their own in Avalon. Observations, apart from noticing that the language and houses were different, were; there is no floors in some of the classrooms, just stone; the toilets are not nice; some of the children do not have a blanket; that the children didn’t care what colour blanket they received, they were just happy to get one; that they don’t have the food we have. One of the issues there is the problem of hunger. Without enough food the children cannot concentrate at school and their learning is severely hampered. 50 children live in the convent with a nun. Each day they need a bag of rice to feed them. One bag of rice costs only $20 but sometimes there is not enough money even for that. That is why we celebrate this special day with a simple rice lunch. A typical day for Soibada children involves waking up, taking your one set of clothing off your hook, helping the younger children get dressed. Walking 20 minutes with a jerry can to collect water; if you are thirsty you can not just go to the tap as there is no running water. You can imagine that this jerry can would get quite heavy on the 20 minute walk home. Next you would have to prepare breakfast then clean up before heading off to Mass. All this before 6.30am!! School is also very Different!!! School is just a few hours as there is not enough teachers or schoolrooms for all of the students. After school you would head back to the orphanage to DO MORE CHORES!!!!! You would do your English lessons and wait for the power to be turned on to do your computer lessons. Today we turn our thoughts to Timor Leste as we celebrate with them their newly found freedom and Independence. Today is also a time to reflect on our own lives and to be grateful for all of the good in our lives. We are all the same... we have the same need for food and water as the hungry and thirsty person, but since we are rarely denied these basics we may take them for granted. Living a fortunate life as we do, we may grow dulled to the tremendous gifts we are granted each day. When what we have is threatened, we may cherish it more. It is not until we experience danger that we begin to truly understand the gift of safety. Take time this week, maybe every week, to consider the good in your life. What are you grateful for that you may have taken for granted? As you eat your food, consider your good fortune to have it. As you take a sip of water, give thanks that it is so plentiful in your life. As you greet your loved ones, appreciate the gift of their health and safety. Or watch TV… consider how fortunate you are to have these luxuries in your life. Think about your lives and the lives of those who have none of what you enjoy. Open your heart. Be grateful for your freedom and material comfort and consider how you might share your treasure. We pray for peace and harmony in our world, especially in Timor Leste, as it continues to grow and develop as a nation. We pray for all our world leaders. May our loving God continue to work through them, so that they lead through their example of love, acceptance and respect for their people. 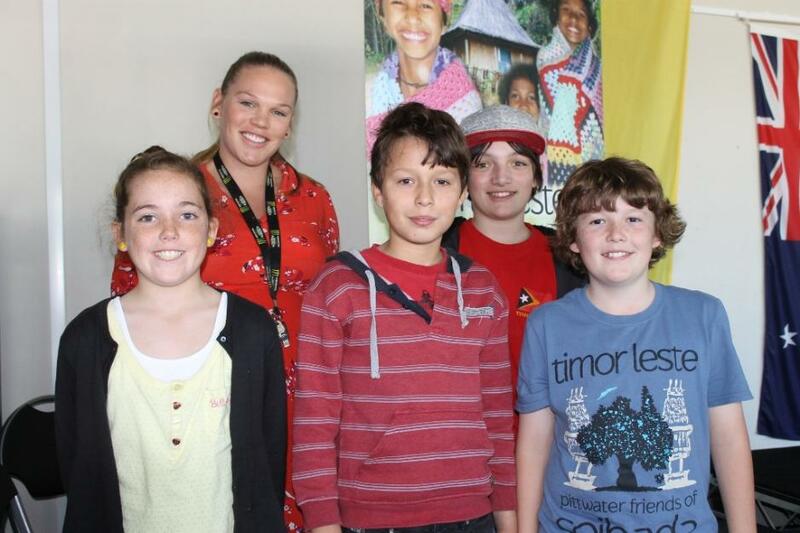 Left to right: Bella Taylor, Jayden Haselbach, Vaughan Harding, Ethan Heyes. The teacher is Rebecca Billing. 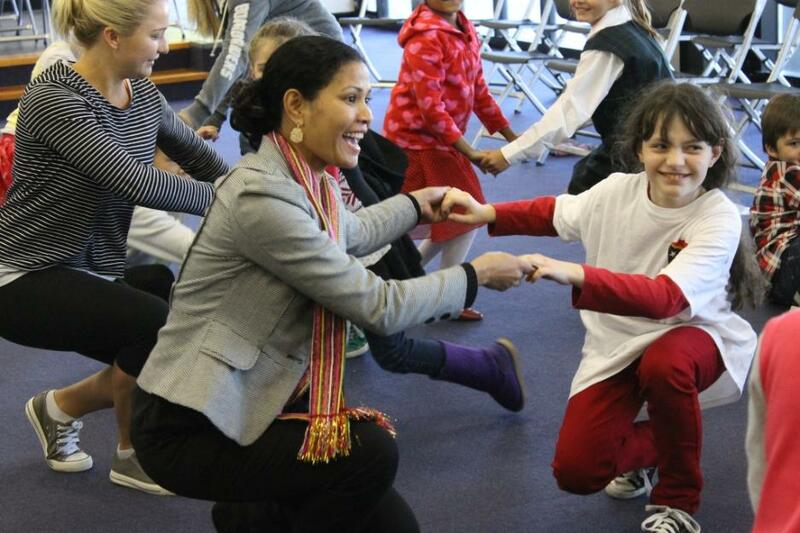 Above: Learning Traditional dances with Leila Dos Santos. Below: Those who danced ! Simple Rice lunch - picture by Peta Wise.